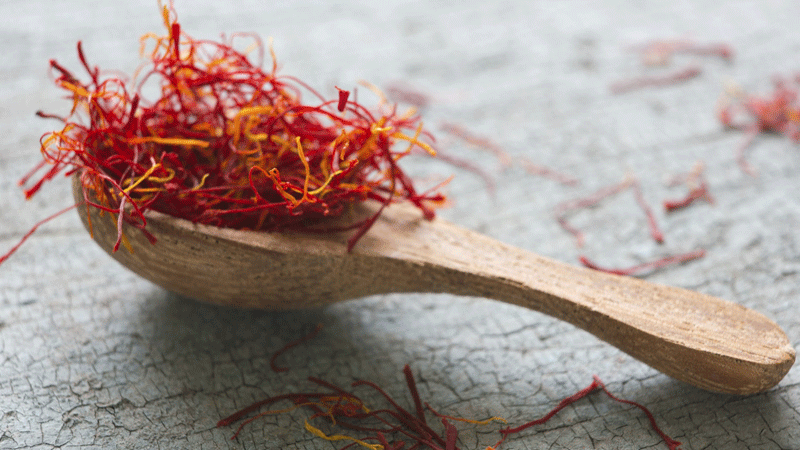 Saffron is the most expensive spice in the world. We aren’t arguing that fact, however. Soak saffron strands in one tablespoon of milk and set aside. In a separate bowl dissolve cornstarch in water and let it rest. Pour milk in a heavy-lidded pan to boil. Once it comes to a boil, lower the flame and let the milk thicken. Half an hour in, add the cornstarch, saffron and sugar to the simmering milk. Stir the dissolved cornstarch before adding to the milk, and keep stirring while doing so. Add cream and pistachios and keep stirring. Let simmer for an hour and a half, or until desired thickness is reached. Add cardamom powder, rose water and switch off the flame. Let the mixture cool completely and pour into kulfi moulds. Freeze overnight. Your saffron kulfi is ready. Because it takes 75,000 flowers to make one pound of saffron, and the flower is said to bloom only one week of the year. No wonder the spice is said to be priced as much as gold — maybe not literally, but almost. My first recollection of being introduced to saffron is from the jingle of Zahoor Zaafrani Patti Tambakoo. This catchy jingle holds a bell for all those born between the 1950s and the 1970s. However, what’s never been established is that was saffron really an ingredient in this two-bit chewing tobacco product? A mystery yet to be solved, and one that makes me chuckle. One of the myths surrounding the origin of saffron tells the tale of the Greek god Hermes, where he accidentally killed his friend Crocus, and whose spilling blood germinated saffron. God only knows how this can be true; all we know is that Hermes products now are also worth their weight in gold, or saffron. Beautiful, war-ravaged Kashmir is one of the places where saffron is cultivated. The spice and its mehek (fragrance) is a big part of the dishes included in Kashmiri wazwaan, and is the oomph factor in it. However, it is said that it was first cultivated in Greece and then further moved east to Morocco, Iran, Turkey and Japan in Asia, and to Spain in Europe. Currently, Iran is said to be the largest producer of the spice. Saffron is a magical spice, and having experienced its aroma there is one thing I know about it for sure, it’s hard to describe it. If I had to, I’d say it’s a smell that has a taste. Like tea leaves, saffron threads have to be infused in hot water for maximum fragrance — usually for 30 minutes or so, a few threads in eight to 10 ounces of water, or any other liquid, hot milk, broth, etc. 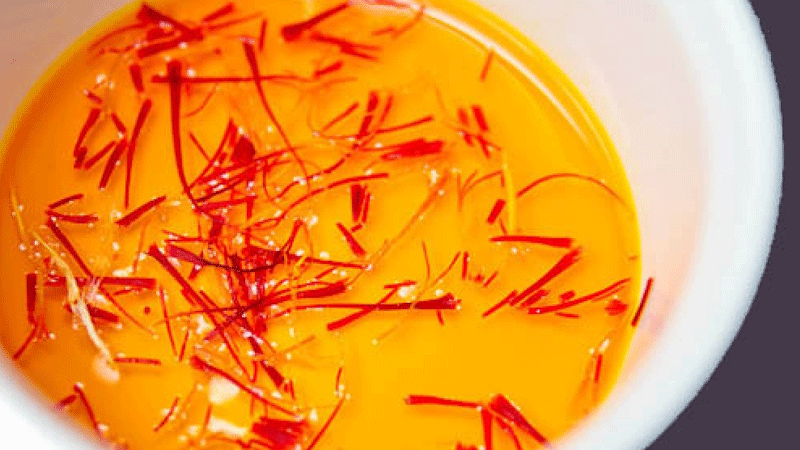 Saffron is high in riboflavin and vitamin B and has long been acknowledged for its medicinal uses. Europeans used it to treat the common cold and cough, and ancient Persians thought it to be an aphrodisiac. I don’t know about it being an aphrodisiac, but I do know that there is nothing as delicious as the zaafrani kulfi, and here it is from my kitchen to yours. Heat oil, add cumin, curry leaves, mustard seeds, turmeric, onions, fry for a few minutes and toss in the vegetables. Cover and cook for 15 to 20 minutes on medium heat, stirring and spraying with water, periodically, once vegetables are tender, add all the masalas, cook for a few minutes, garnish and serve. Lightly peel and grate carrots and set aside. Bring milk to boil and add the carrots, let the milk and carrot mixture come to a boil then add half-and-half and sugar, stirring constantly. Keep stirring until the mixture comes to boil, reducing heat to medium. Once the milk evaporates (should take one-and-a-half to two hours) add heavy cream, stirring constantly. Once cream evaporates, add butter, oil and cardamoms stirring constantly, keeping the flame medium to high. Keep stirring until oil separates, and the colour is a rich beautiful deep orange. Garnish with raisins and almonds and serve. Blend carrots in a blender, adding water; sieve through mulmul (muslin) cloth. Squeeze extracting all juice, discard the pulp and pour the juice into the blender, adding all ingredients. Puree and serve hot or chilled. In a separate pot (colander) boil water adding whole garam masala and bay leaves. Once the water comes to a boil, add pre-soaked rice keeping the rice to tender crisp phase, since we cook the rice completely in the dum phase. Drain the rice, layer the pot with rice, topping with a layer of biryani masala, adding a second layer of rice. Top with fried onions, sprinkle food colouring, cilantro, mint, a pinch ofgaram masala powder and 2 tbsp. kewra. Seal pot with foil and lid. Notching full heat for five minutes and medium to low heat for 15 minutes to complete the dum. Let it sit for 10 minutes, mix and serve. Garnish with green chillie, mint and chopped cilantro. Serve with a side ofkachumer (chopped onion, tomato and green chillie salad) and raita. I sat in the January cold of Michigan craving biryani, the painful realisation that my migration from Pakistan had taken me away from most desi delights. Dejected, head bent I walked to the mailbox, battling the bone chilling wind and meandering the snow and then, I smelt it; the aroma of desi masalas. I followed the smell to 70-year-old Fakhrunissa auntie’s apartment on the second floor. I rang the doorbell, and auntie warmly welcomed me to a delicious mutton biryani lunch. The same process of synthesis went on in the kitchens. Here, the delicately flavored Persian pilau met the pungent and spicy rice dishes of Hindustan to create the classic Mughlai dish, biryani. One of the most distinctive Persian culinary techniques was to marinate meat in curds (yogurt). For biryani onions, garlic, almonds, and spices were added to the curds, to make a thick paste that coated the meat. Once it had marinated, the meat was briefly fried, before being transferred to a pot. Then, following the cooking technique for pilau, partially cooked rice was heaped over the meat. Saffron soaked in milk was poured over the rice to give it colour and aroma, and the whole dish was covered tightly and cooked slowly, with hot coals on the lid and around the bottom of the pot, just as with pilau. The resultant biryani was a much spicier Indian version of the Persian pilau. Nowadays, it is a favorite dish in the subcontinent at all wedding celebrations. Famed Mumtaz Mahal is credited for the modern day biryani, she thought it to be a complete meal and suggested it for troop consumption, during wartime and peace. The evolution of the biryani from pilau is fascinating. History suggests that the dum method of cooking comes from the Persian style of cooking, and may have travelled to the Indian subcontinent from Persia through Afghanistan, or from ancient Arabia to Kerala through the Arabian Sea with traders. Nonetheless in Persian, birian means grilling or frying before cooking, hence the method to cook biryani. Today, we boil the rice before the process of dumbut tradiontionally, when biryani was prepared, the unwashed rice was initially fried in butter or ghee, before boiling. It was believed that frying the rice gave it a nutty flavour and also burnt the starch, gelatinising the outer layer of the rice. Separately, a lamb leg was set to sit in a marinade of curd, spices and papaya and then cooked to tenderness. Once the meat was cooked it was layered with the half cooked rice, infused with droplets of rose water, saffron and mace (these spices gave it a flowery and royal essence) and were then sealed in ahandi and set on low flame until the rice was fully cooked and plumped, and ready to be served. Biryani has variations from different regions of the subcontinent, all claiming that their twist on it is the best. It is so rumoured that before the advent of Mumtaz Mahal, Akbar the Great made Asfa Jahi the Nizaam of the great state of Hyderabad. The Nizaam wanted Hyderabad to own the royal dish, thus he had his kitchen give it a twist and the outcome is the legendary Hyderabadi biryani. Tipu Sultan of Karnataka spread the biryani to Mysore, giving us the Mysoree biryani, but the most special biryani may be the one that does not have meat. The nawabs of the region hired vegetarian cooks to create the meatless biryaniand thus tahiri came to be. Despite all the different twists to the dish; Sindhi biryani with potatoes,Memoni biryani with spicy masala, kacha gosht biryani cooked in whole garammasala spices sans tomatoes, it is actually Lucknow that lays the ultimate claim to it. The Awadhi dum biryani is another gift the nawabs gave to the northern part of India. In the 1640s, Portuguese priest Fra Sebastian Manrique visited the subcontinent and wrote about the aroma of biryani in the Punjab, namely Lahore:The specialty of the Awadhi dum biryani is that the meat is half cooked and the dish is brought to cooking perfection through the dum pukth style of cooking, almost like the ancient times when berian was buried into the ground until the rice plumped. This city of tents contained market-places, filled with delicious and appetising eatables… Among these dishes the principal and most substantial were the rich and aromatic Mogol Bringes [biryanis] and Persian pilaos of different hues… Nor did these bazaars lack the simple foods of the native and superstitious pagan; as to meet their taste many tents held different dishes of rice, herbs and vegetables, among which the chief place was taken by the Gujerat or dry bringe….[biryanis]. Today, I share with you auntie’s biryani recipe. It is just what an immigrantdesi needs to combat severe homesickness. Here it is, from my kitchen to yours. Beef when combines with spices, yogurt and lemon juice it makes a perfect treat for everyone. Warm up the family and friends with scrumptious Beef Malai Boti. Lightly flat beef boti with hammer. In a bowl put beef boti, tikka boti masala, ground ginger, red chili powder, garam masala powder, salt, papaya paste, green chilies and yogurt. Marinade it for half an hour. Put beef mixture in a pan and cook on slow flame until tender and water dries. Now add oil and cook till oil comes on top. Then add lemon juice and cream and simmer for 5 minutes. Serve delicious malai boti with roghani naan.